When you get started with GoNoodle, we set you up with a class and champ, so you can get going faster. You may want to add a class for practice, so you don't impact the progress your students have made. 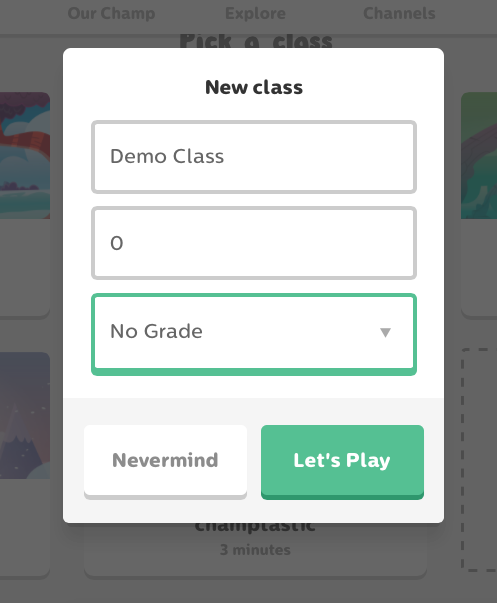 To make a practice class, simply create a new class (see our support article on class creation) with the name Practice Class (or whatever you'd like), 0 students, and No grade. Click the Menu button in the top left of GoNoodle. Name the new class. Set it to zero students, and select "No Grade" as the class grade. Switch to your Practice Class anytime you want to preview an activity you haven't utilized yet. Any minutes you earn in your exploration won't throw off the earned totals in your student-facing class. Use a Practice Class for showing GoNoodle to another teacher or colleague so you don't affect your student classes. Use a Practice Class to check out new features in GoNoodle before using them with your students.